Most AO-related email support groups are spin-off groups started and maintained by individual AO moms and are independent of the AO Advisory. The original AmblesideOnline email list (now replaced by our Forum) and CMSeries are the only "official" lists, and are the only lists that are moderated/overseen by Advisory members. All other lists are independent and may not reflect AO, HEO, or the Advisory. Links to these lists are provided for members' convenience. AO Advisory members do not moderate, manage or oversee any lists except the original AmblesideOnline email list (now replaced by our Forum), and member discretion is advised. These formatted etext lists are non-discussion lists for the sole purpose of making formatted etexts of public domain materials available to AO users. PDF lists have etexts available as PDF files and Word lists offer the etexts as Word documents. Texts on the Word lists are formatted in double columns with a wider margin on the inside edge of each page so they can be printed double sided and then bound without it effecting the print. Formatted etext lists are not owned or managed by Advisory members; they are the volunteer efforts of AO list members. This group is for us to share and compile ideas for different ways of narrating the books from the AmblesideOnline curriculum. for AO users in Arkansas. 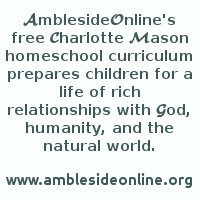 AmblesideOnline Moms In Arkansas (AMIA) is a statewide Charlotte Mason homeschool support group for mothers in Arkansas using (at least some parts of) AmblesideOnline and/or House of Education Online. http://groups.yahoo.com/group/CMHomeschools/ in the NW FL area. http://uk.groups.yahoo.com/group/AO-UK "for users of the AmblesideOnline curriculum who are based in the UK or who would like to discuss how the curriculum can work within the the UK. The aim is not to replace the main AmblesideOnline discussion list, but to provide a place in which issues specific to UK users may be discussed. A support group for those homeschooling and using AmblesideOnline's curriculum with children who have a learning difference i.e. a "learning disability". A support group for AO parents to discuss ways to implement the curriculum and Charlotte Mason's methods with their gifted or twice-exceptional (gifted/learning disabled) children. As with any curriculum, AO doesn't always fit each child "like a glove" and thus this list was created to help parents modify and supplement the curriculum to meet the needs of their gifted child. Links to these lists are provided for members' convenience. AO Advisory members do not moderate, manage or oversee any lists except the original AmblesideOnline email list (now replaced by our Forum) and CMSeries, and member discretion is advised. Strictly for the buying and selling of resources (biographies,poetry and art books, teacher resources, etc.) that are in conformity with the Charlotte Mason "twaddle-free" philosophy. These are only a few of the many Yahoo email lists for those doing the Charlotte Mason method, and they change often as more are added. To find more CM lists, go to http://groups.yahoo.com/ and search for "Charlotte Mason." This is only a sampling of lists for CM moms with specific needs. There are also many regional/geographical CM lists as well as lists for those combining CM (though not necessarily AmblesideOnline) with other methods, such as Sonlight and The Well-Trained Mind. For persons who are using or are interested in using the Charlotte Mason Philosophy for education (including homeschooling), or to enrich their own lives. ...any CM question is welcome at any time and 'newbies' are encouraged to ask questions. For those familiar with and implementing Charlotte Mason's methods of education. A group endeavoring to either study ahead of time or along with their children the AmblesideOnline and House of Education Online Curriculums. For Charlotte Mason Mom's using the curriculum outline suggested in Karen Andreola's summer of 93 Parent's Review titled, "A Formidable List of Attainments for a Child of Six", and also trying to complete the Kindergarten Skills list as described in Catherine Levison's book, A Literary Education. For those desiring to start a CM Cottage School in their area, to discuss what is involved in the putting together of a cottage school, the methodology of the CM Cottage school and where to begin and how to move on. LDS homeschoolers who are interested in Charlotte Mason methods and philosophy. To discuss and share ideas on implementing the educational methods of Charlotte Mason within the traditions, customs and faith practices unique to Catholicism. Active message board for Catholic CM homeschoolers "To help parent educators to promote a new paradigm for home education which focuses upon developing the whole personality of the child--the heart, soul, and mind--to pursue a happy, wholehearted, academically excellent, spiritually complete childhood. The board moderators are Catholics in union with Rome who live and learn with their own children." For Aussie, Kiwi, New Guinea and nearby region families, using Charlotte Mason-inspired, living books, literature-rich, "wholehearted child", and lifestyle of learning, approaches. For parents (married or single) trying to utilize Charlotte Mason's methods while working at home or outside the home. One mom's list sharing her experiences with AmblesideOnline, Charlotte Mason, LivingMathForum and homeschooling students with non-verbal learning disability. Note: to download files using Windows Explorer (IE), right-click on the file name and choose the "save target as..." option. Make a note of where the file is saved so you can find it on your hard drive. Large files may take a few minutes (many minutes with a 56K modem) where it appears that nothing is happening. It may take some patience to wait until the file completely downloads. Some etexts are in plain text format to make them accessible to the largest number of members and to save space. To download, right click and choose the "save target as..." option. Make a note of where the file is saved on your hard drive. Either copy and paste into your word processor or open the file from your word processor. You can change the font size and style from there as desired to print or read from your computer screen.. The plain text documents may not have line breaks - this makes them adaptable to any word processing program or font size. This means that, if you open the file in an application without "word wrap," the words will appear as a long line that goes off your computer screen. This is normal! To correct this, either copy/paste the text to your word processor, or turn on the "word wrap" option. In Microsoft Notepad, this is under the Edit button.